Welcome to our place, were we used to live whole family. Our house is old, but our flat is bright and nice. It's a perfect place with a balcony and green view with sounds of birds. One of the best restaurants is located the next street. We want to keep guests happy while staying in our house. Our house is surrounded by greenery and is in a lovely calm place, but keep in mind, that we are away from the bustle of the city center. You can easily reach the center on foot within 15 min. If you are traveling with a baby or small child, we can offer a folding cot. We are close to ferry (15-20 min walk) to visit our jewel - The Curonian Spit or to reach the sandy beach. Love. Live. Eat. Enjoy. Explore. Lough. Smile. Be together. We offer to tourists our lovely flat, we used to live with my husband and two little boys. Our family needed more space, so we moved to new place and decided this appartment is perfect for visitors of our city. It's bright, nice and cozy. It's filled with our love and good emotions. Our appartment is in very peaceful area, in warm period of a year you can enjoy green view and birds sounds. In our appartment we have central heating system. In the kitchen you can find sugar, tea, coffee and italian coffee pot. It will take you just few minutes to have great coffee. Kitchen is fully equiped (cutlery, dishes, pots and other main tools). The first impression of the outside of this building may not be what one would expect of a holiday home but look beyond. The exterior and common close are run down and tired-looking (June 2017) and the area seems a little forbidding, at first, but the apartment is well-appointed, with good use of the available space and any initial concerns will soon abate. It is, essentially, one large room with the entrance, kitchen, shower room at one end, bedroom space at the other and the lounge in the middle with access to a small balcony; the bedroom can be screened off behind sliding doors. 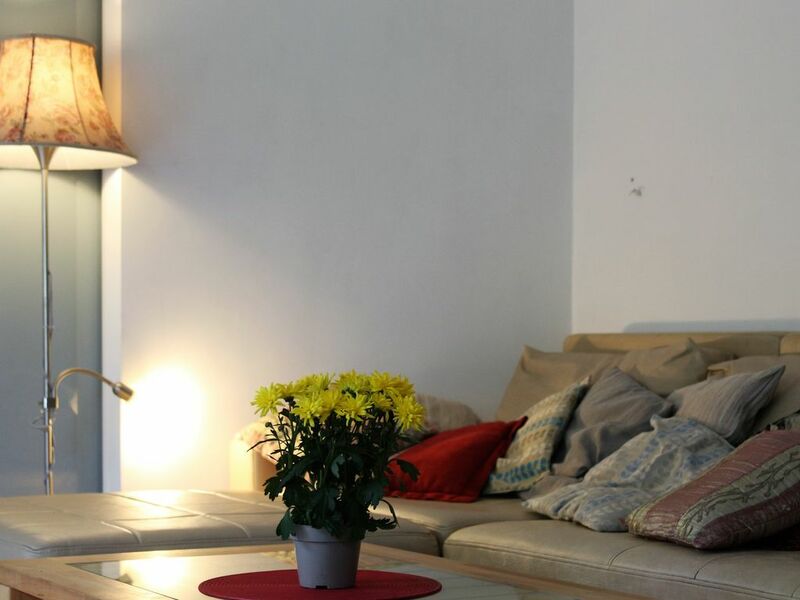 It is a bright, comfortable space and Jurga has taken great care to make it homely without being cluttered in any way. We really appreciated little touches, like fresh flowers and treats and the fact she had taken time to plant up the window boxes before we arrived. All the essentials are there, including ample storage, and Jurga was a friendly, responsive and accommodating host without being at all intrusive. The flat comes into its own in the evening when it is very peaceful, with just the view of the trees from the windows, very little street noise and a perfect little hideaway in which to relax after busy days. Again, on first arrival, it seems further from the "centre" than would be ideal but it truly is only ten minutes walk to the old town and the community around the flat holds its own interests, so is very worthy of exploration. You are a couple of blocks from the main thoroughfare with access to buses serving the whole town and beyond. Klaipeda is a lovely town with much to see and do there and around, so it would suit a variety of holiday preferences. We had a lovely trip and would certainly return.